When Lusk Field House was first used, the platform stood at the north end of the building. 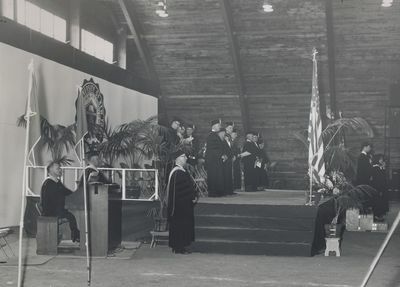 In 1964, Acting President Ben Sueltz and Dean Manson Jennings and the College Council stood while the platform marshalls, Andy Banse and Ross Allen, waited for the graduates to finish filing in. Organist Fred Bielder played the organ as graduates filed in.